Brian was named for inclusion to the New York Super Lawyers Rising Stars list, a Thomson Reuters lawyer rating service for lawyers under 40, for 2017 and 2018. 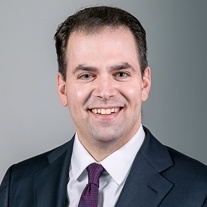 Brian H. Fischkin is an associate in the Real Estate group focusing on construction related litigation and transactions. Brian’s practice focuses on construction and real estate, representing owners, architects, contractors and other design and construction professionals in both transactional and litigation matters. Transactional matters have included residential and commercial projects of all sizes. His representations in litigations have spanned various state and federal courts at both the trial and appellate levels, including the United States Supreme Court, where he authored an amicus brief filed on behalf of 68 Members of Congress. Brian received his J.D. from Rutgers University School of Law in 2009, where he was an editor of the Rutgers Law Review, and his B.A, with distinction, from Yale University in 1998. Brian is admitted to practice in New York and New Jersey. Prior to joining Olshan, Brian was an associate at Wasserman Grubin & Rogers LLP and at Fried, Frank, Harris, Shriver & Jacobson.